I love the last name — it’s Italian — Old North End Boston Italian — and it reminds me of the Spanish word for hope. I like to think this photo is from her days in Bohemian Provincetown where she waitressed after graduating high school and before she went to Art School. I miss her. I want her to know she is not forgotten. I think sometimes we want to be remembered beyond our family and friends. Remembered by the big wide world. But maybe family and friends are enough. i love old photos so much. i love daydreaming about what it was like to be there, then. and send me your address because you win the giveaway!! Love the shot. 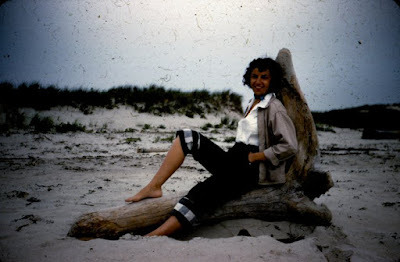 Reminds me of some of the photos I found of my Mom recently. Those old photos are precious. I love the hand colored ones. My dad took some of my Mom when they first met. He did photography and he hand colored some of them. He had her pose in some “beauty” shots and they are really well done. I’m sure they treasured them. I know she lives through me!!!! And she’s been getting alot of attention lately. It helps my “me” stay small when I know it’s really her.